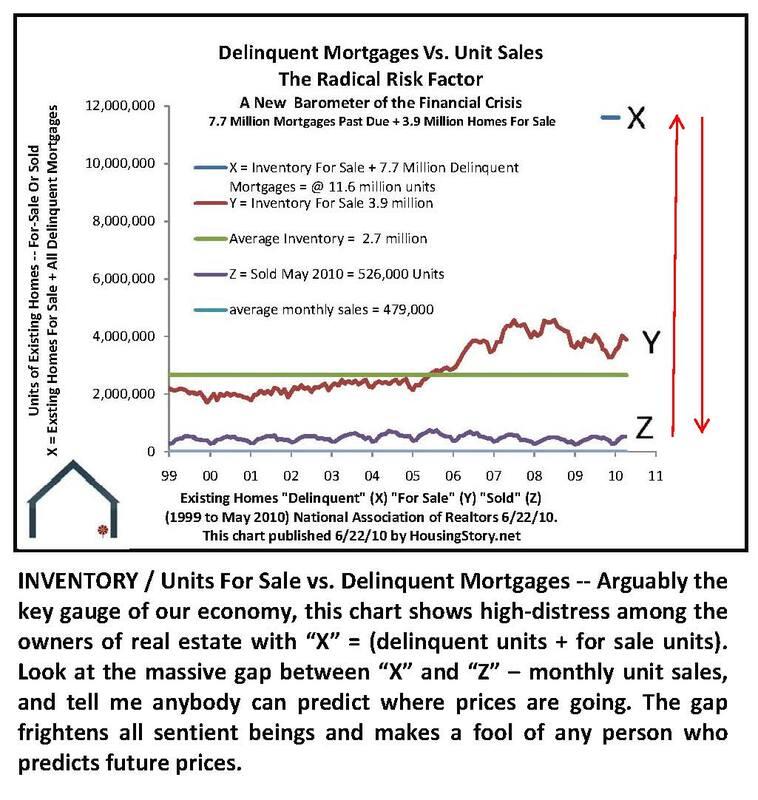 Is it possible you are double counting “X” since delinquent mortgages could be for properties already listed. I see many “distressed” sellers on the local foreclosure list who also have their homes listed for sale. I like your work – keep it up! Compare to the historical gas price chart (link below) and you will see a fall in sales when gas prices go up. I have seen everyone and everything blamed for the crash but gas prices are rarely mentioned. Just think how things will be when cap and trade makes energy prices too high for people to heat a full size home. You will see a downsizing on a massive scale in the what people will accept as housing and a loss of suburban home value. Mcmansions in the countryside will be wildlife habitat as they are quickly reclaimed by nature when the banks can’t find buyers as the owners walk away form their mortgages. There are many in the environmental movement that see this as a good thing but they have no clue as to how energy costs effect the cost of basic food items. You can’t grow enough in your window-box garden to feed yourself much less your family. High gas prices take consumer’s disposable money out of the economy, so there is less to spend. Since most of these dollars go out of the country (about 70%) it is taken out of the economy. Today, gas prices are soft, but tax increase, expected tax increases and added regulation (soft taxes) are having an effect of holding down spending. In January 2011, the start of the Obama tax increases begin (OK, the tan tax started on July 1st), you will see a double dip recession, since more disposal money will be taken out of our economy. Additionally, businesses will not invest until management has more positive news on the government taxes and regulations (not more taxes, regulations or unfunded mandates). When the taxes, regulations and uncertainty are major factors in determining business profitability models, most company’s will not invest until these models show a substantial return on investment (after taxes are factored), and uncertainty is missing or minimized in the markets. Once this occurs substantial increase in jobs and investment happen, but these are not present in today’s market. Without these factors job growth will be dismissal and the real estate market as well. @txhman Disposable money was taken out of the economy when the d-bags financing shacks on the coasts for 500K finally got their pyramid scheme exposed and the whole card house collapsed. That kind of make believe, cooked up by the Fantasy Experts Selling Wall Street’s Yellow Brick BS, is what has been driving, navigating, guiding, inflating, puffing up, ego boosting, GDPing and not hurting the Precious, Precious Feelings of the non-productive, dysfunctional, gutter and ghetto American economy for at least a decade. All that play money is gone, and so aren’t most of the BS derivatives that created bullcrap wealth out of thin air, or at least I hope they are – who knows what roulette wheels Wall Street managed to keep spinning in the latest financial reform. THAT kind of ‘disposable’ cash floating this economy is a lot more of a factor in keeping the Fragile Ego of the Economy bouyant than are small tax increases. Stop blaming government, the US economy is a fraud that only survives because guys with beards in suits and glasses say everything is OK..and that is a systemic problem. Compared to the Anarchy and Chaos of Global Financial BS, a Federal government with a goal of maintaining a NATION and the PEOPLE in it isn’t just refreshing… it’s fundamental glue a Libertarian won’t stop complaining long enough to realize is needed now more than ever.